Did you know? 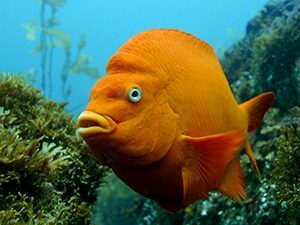 Garibaldi are California’s official state marine fish and it’s illegal to remove them from their natural environment! Although they can occur as far north as Monterey Bay, they are much more common in the warmer waters off of Southern California and the Channel Islands where they are seen jetting through kelp forests. Fiercely territorial! Adult garibaldi guard their territory and become very aggressive while protecting their nests and eggs against intruders. They have even been known to attack much larger animals and human divers that come too close! What’s in a name? The brightly colored Garibaldi were named after an Italian military and political figure, Giuseppe Garibaldi, who was known for wearing his trademark red shirt.